“Many commenters [on the Draft EIS] reiterated their concern that the Project will not relieve highway congestion in Honolulu. FTA agrees, but the purpose of the Project is to provide an alternative to the use of congested highways for many travelers. 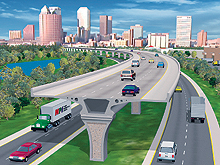 This alternative to the use of highways is especially important for households that cannot afford an automobile for every person in the household who travels for work or for other reasons.” FTA's Record of Decision page 208 of 217. Even worse is the fact that when you read the rationale for building rail in the Final EIS, you find that they never had any intention of reducing traffic congestion below today's unbearable levels. The city is very coy in talking about future traffic congestion. In their public statements they talk reducing traffic congestion but not in the documents that have to be submitted to the federal government. Even this statement does not really tell us how bad traffic is going to get. For that we have to go to the fine print in table 3-12 of the AA. Here we learn that the Volume/Capacity ratio for H-1 at "Kalauao Stream Koko Head bound" (H-1 regular lanes where they are abreast of Pearl Ridge Shopping Center town bound during the peak hours) is presently 15 percent over its capacity,,which is why it is so congested. When we look in last but one column for "Kalaeloa - Halekauwila" rail transit alternative for 2030, we find that this V/C ratio increases to 1.81, or 81 percent over capacity. This is an amount of congestion that is difficult to comprehend unless you were caught in the H-1 traffic on Martin Luther King Day early in 2007.. The AA is a document that has to go to the Federal Transit Administration.